​When you are considering the purchase of cabinets for a new kitchen, bathroom, or any room in your home, it's important to consider the materials that go into making your cabinetry. UltraCraft selects materials that ensure product longevity, durability, health and safety as well as overall beauty. It's precisely because of this attention to the materials that go into our cabinetry that we are able to stand behind the industry's only 100-Year Limited Warranty. Cabinets are made from 5/8"-thick, furnituregrade, medium-density, furnitureboard laminated on both sides with thermoset melamine. Furnitureboard is certified as EPP Environmentally Preferred Panels by the Composite Wood Council.All Plywood Construction is an available option for cabinets with Wood doors. Shelves are 3/4" thick, edgebanded on the front, full-depth and adjustable, with steel shelf pegs unless otherwise noted. Cabinets feature matte PVC edge banding. The top, bottom, and back of each cabinet and the front of each shelf are edge banding in neutral woodgrain or white PVC. The face exposed edges of all cabinets are edge banded in coordinated PVC edge banding.All cabinets with exposed wood veneer interiors feature coordinated wood veneer edge banding. Cabinets with Acrilux feature aluminum silver edge banding on the front of the cabinet and the front and back of exposed cabinet shelving. Standard hinges are fully-concealed, 107°, clip-on, steel, self-closing, with integrated soft-close mechanisms and can be individually adjusted six ways (at least 2mm each direction) to ensure accurate door alignment. Doors automatically close when within 10° of the cabinet. 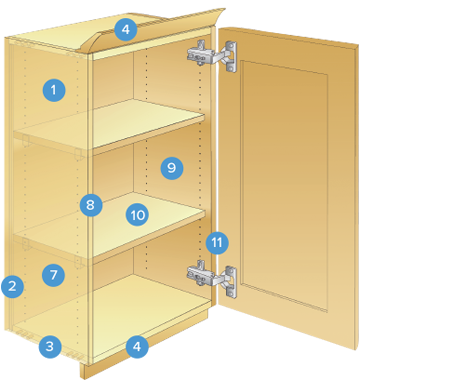 Optional free-swinging hinges are used on most cabinets with touch latches. Certain corner wall and base cabinets use a 170° hinge. Hinges carry a lifetime manufacturer’s warranty. Drawers are available in two material choices - Hardwood Wood Dovetail or Metal.Hardwood Wood Dovetail drawers and pull outs are 5/8" thick with a fully captured 1/4" bottom and feature full-extension drawer glides and a soft-close mechanism. These drawers and pull-outs come with a Natural finish. Metal Drawers and pull outs, which also come standard with a soft-close mechanism, are standard on all Acrilux door styles, and are an available option on all other cabinets.